What Are the Dangers of Aspartame for Kids? 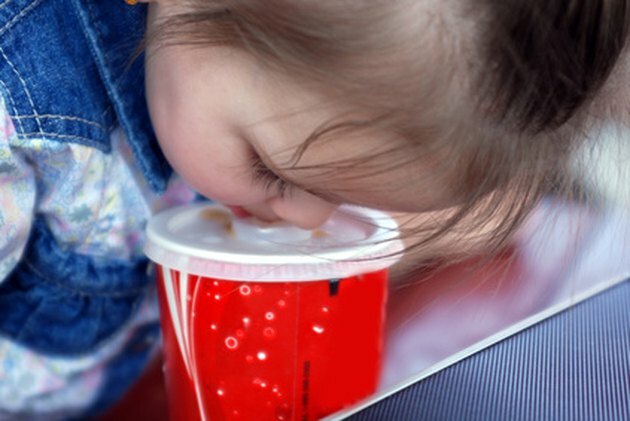 The dangers of aspartame for kids—and adults—are a matter of significant controversy. The FDA has certified that aspartame is safe. But there are fierce opponents of aspartame that claim, with a fair amount of evidence, that the FDA approvals of aspartame were colored by politics and money, with a number of FDA officials that were involved in the approval process receiving jobs, either directly or indirectly, from the original manufacturer, G.D. Searle, amid claims that Searle doctored research results that it presented to the government. So the decision to allow your kids to drink diet sodas, and consume many other products that contain the sweetener, is not black and white. Aspartame is a sweetener that combines two amino acids, aspartic acid and phenylalanine, and a small amount of menthanol. People with a condition called phenylketonuria, or PKU, cannot metabolize pheylalanine, which can result in genetic disorders in those individuals. A few researcher think that people without PKU can be similarly affected by aspartame. Aspartame is 180 to 200 times sweeter than sugar and contains no calories. In addition to diet soft drinks, it is used in more than 6,000 consumer products, ranging from children's Tylenol to toothpaste to cereals to juice. What Do Aspartame Opponents Claim? FamilyMatters.tv claims that the ingredients in aspartame can cause formaldehyde accumulations, especially when products containing aspartame are subjected to heat. The group claims that aspartame may cause symptoms of fibromyalgis and lead to memory loss. It cites a Swedish study that linked diet drinks to brain tumors. NaturalNews.com cites studies that have linked aspartame to brain damage, tumors, and endocrine distruptions. One European study from Italy concluded that aspartame is a carcinogen. Mercola.com claims that 75 percent of adverse reactions to food additives that are filed with the FDA relate to side effects from aspartame, ranging from headaches to memory loss to heart palpitations. It also stresses that menthanol breaks down into formic acid and formaldehyde, a deadly neurotoxin. It says that many Desert Storm soldiers, who drank warm diet soda drinks, came home suffering from symptoms similar to those in people with fomaldehyde poisoning. The FDA dismissed the European study in Italy as flawed. It reaffirmed in 2007 that aspartame is safe for kids and adults. The National Cancer Institute states that there is "no clear link" between aspartame and brain tumors. Maybe. Many of the reports that dismiss the dangers of aspartame are based on a 2005 FDA study. But opponents of aspartame claim that the 2005 study was merely the rubber stamping of suspect research by an agency that was, at the time, in the pocket of the industry. In the last few years, New Mexico, Hawaii and California lawmakers have raised safety questions about aspartame. In 2010, the British Food Standards Agency launched an investigation into possible side effects from aspartame. The effects of any substance in food or drink will be stronger in kids than adults, simply because kids are smaller. As a parent, you must decide how much of a risk is acceptable when it comes to aspartame and the health of your kids. Kids Health: Is Aspartame Safe for My Child? Family Matters: Aspartame, Aspartame, and more Aspartame! Are Diet Coke Aluminum Cans Safe? What Are the Side Effects of Phenylalanine & Aspartame?